SETF - A not-for-profit organization dedicated to serving the southeast side and south suburbs of Chicago by promoting environmental education, pollution prevention, and sustainable development. Guest commentary from Rhea Suh of Natural Resources Defense Council. The Southeast Environmental Task Force is grateful for its association with the NRDC, and for all they have done to help on the southeast side of Chicago. Community activists are leading a shift from dirty fuels and heavy industry to clean energy and sustainable business. On a warm day last August, as family and friends gathered in Mari Barboza's backyard for a birthday cookout, afternoon winds whipped up a toxic torrent of jet-black dust that swept across her community on Chicago's Southeast Side. Blown from a nearby mountain of grit called petroleum coke, or petcoke,the vile fog choked the life out of the party. Mari scurried to cover food she'd prepared while neighbors scrambled to herd children inside to flee the pollution, which irritates throats and lungs and worsens asthma and other respiratory ills. "We can't even be outdoors, we can't even open our windows," Mari explained to me last week. "We're like prisoners in our own houses," she said, as huge dump trucks rumbled past the piles of petcoke, a harmful by-product of oil refining. "We can't even have a good time in our own backyards." For people living in southeast Chicago's aging industrial corridor between the Calumet River and Lake Michigan, toxic petcoke dust, abandoned steel mills, blighted lots, and heavily polluted waterways are all part of a sorry legacy that undercuts health, environmental quality, and economic opportunity. What's needed now, for Mari's community and many others like it across much of our industrial heartland, is a deliberate shift from the heavy industry and dirty fuels of the past to a new generation of economic growth based on the clean energy and sustainable business models of the future. "We are part of an old industrial economy and we're looking for a just transition to a low-carbon economy, but we still have the burden of the old high-carbon economy," says Thomas Frank, an activist with the Southeast Environmental Task Force, standing up for communities along the Calumet industrial corridor. "We're locked into the economic patterns and land-use patterns of the old industries." The community is held hostage by its need for good jobs, while trapped by its history as an aging industrial, waste disposal, and fossil fuel sacrifice zone. "It's slowly dying," says Peggy Salazar, executive director of the Task Force. "That's what happens when you don't invest in a community." The community, though, refuses to die, in part because of the heroic stand that people like Mari, Thomas, and Peggy are taking to fight for a brighter tomorrow. "We want job creation, but we want it to be correctly done from the beginning and be sustainable for the environment and the future," Peggy says. "We see the opportunity for us to change the conversation and the potential for renewable energy sources, moving away from fossil fuels to renewables." The community is determined to play its role in the shift to a clean energy future. For most of the 19th and 20th centuries, the Calumet industrial corridor was a center of heavy industry that helped to define American enterprise and might. The community made steel for the railroads and bridges that formed the sinew and spine of American commerce. With access to the river and Lake Michigan alongside junctions of highways and railroads, the region provided an unparalleled transportation hub for shipping U.S. products -- across the country and around the world. And it produced basic materials for the automobiles that moved the nation and the tanks that helped secure our freedom. The region held a central place in the organized-labor movement and hosted major ethnic communities that brought their own sets of skills and cultural contributions, while the area's natural lakes, rivers, and wetlands nourished a rich and vibrant web of wildlife. The residents are rightly proud of their heritage and eager to be partners in the new economy that's remaking our country once again. They want to help build the wind turbines, solar panels, and hybrid and all-electric cars that can move the country forward. "We make things in this neighborhood. We're union workers," says Olga Bautista, a mother of two who heads up the Chicago South East Side Coalition to Ban Petcoke. "We want this area to be a model for the rest of the world of what a sustainable and green economy can look like." That's far more than a pipe dream. Through a plan called the Calumet Area Vision, the coalition has outlined a promising way to pull together the region's natural, cultural, historical, and economic assets into a cohesive and viable whole. "This is one of the oldest and largest industrial complexes in the world," says Frank. "To be able to reposition it in a new, greener economy would be a great win." It would be a win for all of us. 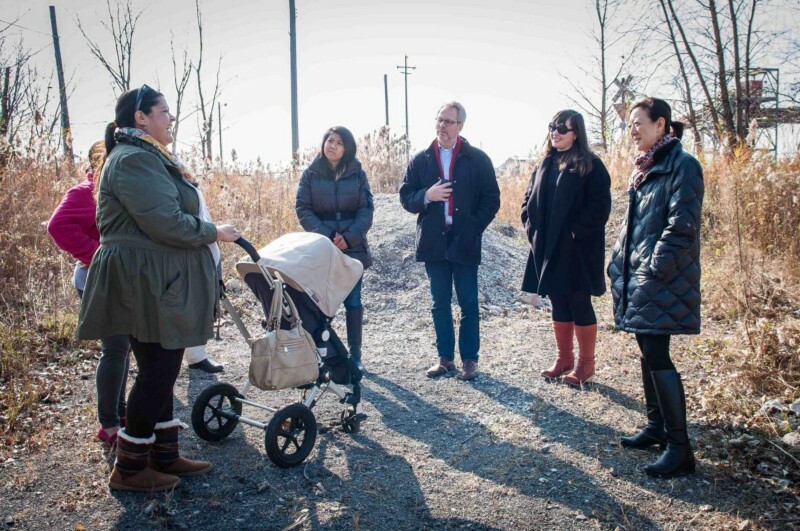 That's why NRDC is standing with these community leaders, helping to provide such expertise as we can, while learning from the experiences these community leaders share and the example of assertive activism they set. L to R: Olga Bautista, Mari Barboza (obscured), Isra Pananon, Henry Henderson, Elizabeth Corr, Rhea Suh. We're working together to get rid of the mountains of petcoke that threaten the health of residents and loom over the Calumet River like some toxic omen of doom. We're challenging other misguided projects that seek to perpetuate land uses that would sentence the future of the region to the depredations of the past and reinforce its role as a sacrifice zone. And we're working to advance the Calumet Area Vision as a way to leverage the region's unique character and strengths to create a future of promise and hope. It starts by recognizing the past glory and true potential of this special corridor of people and place. As Thomas Frank puts it, "We have to get this place labeled 'Too big to fail.'" Guest Blog- Another environmental disaster waiting for some intervention! Here is another environmental disaster waiting for some intervention! Fly dumping - the dumping of any waste material on public or private property without a permit. Back in the early 1900’s the State of Indiana decided that the Kankakee River was a big nuisance. The river flowed through a vast marshland that people in power looked at with distain. The swamp had no value in their eyes. It didn’t matter that the marshland gave unbelievable resources to a myriad of living creatures – man included. For centuries the Kankakee marshland gave abundant natural resources, but would soon be raped and pillaged in the name of progress. Underneath the slow moving water was black dirt that had been undisturbed for centuries. This black soil was perfect for agriculture. Influential landowners persuaded Indiana politicians that the best use of the land was to grow corn, soybeans, wheat and hay. This required the marsh to be drained - and so it began. The State of Indiana began cutting channels into the Kankakee River and draining the water. Indiana sold the soul of the Kankakee marsh. The drainage was not enough to satisfy the thirst for crops. The river was not only drained, but Indiana began to turn the curving and winding Kankakee River into one long, straight channel for miles and miles. Now crops could be planted right up to the channel - and every last square foot of land utilized in the name of progress – and profit. By 1923, the Kankakee River was an unrecognizable ditch. Gone were the curves and oxbows of a healthy river. Gone were the marshlands that served as home to wildlife and migratory birds. Since rivers do not recognize state lines, the Kankakee begins in Indiana but continues to flow into Illinois. If you look at Google maps and view the river east of Momence, you will clearly see the difference between the Indiana side of the river - and the Illinois side. In Illinois the river curves and bends like a healthy river should, while in Indiana the channel is as straight as when it was dug back in 1923. Man had tamed and trampled on the Grand Marsh with disastrous results. One of the biggest problems is one we cannot see. The Illinois side of the river looks healthy, but it is not. Due to the channelization of the river in Indiana, there are tons of sand and sediment that are washed down the river channel from Indiana to Illinois every year. This sediment from Indiana has destroyed fishing habitats, increased flooding, and is choking the Illinois portion of the Kankakee River. This fly dumping started almost a century ago and continues today. Even today Indiana dredges their portion of the river to remove the build up of sediment – and continues to call it improvements, just like they did 100 years ago. We can’t change the past, but Indiana is now doubling down on pouring silt and sediment into the Illinois portion of the Kankakee. There are plans to create a huge gravel quarry upstream of the Kankakee. This quarry has permits to pump millions of gallons of water every day into a tributary of the Kankakee River. Now I’m assuming that since this water will be coming out of a rock quarry, this water will contain silt, sediment and solid particles – just what the Kankakee River does not need. We don’t need every last bushel of corn and beans, and we don’t need every last truckload of gravel – especially when it will cost us a river in exchange. The Kankakee River was created by an 'Act of God' - but it sure seems like Indiana is trying to wipe it off the map. The Shopper Publisher, and big fan of leaving rivers to do what they do best. Officials unveiled the first half of a long-awaited trail that will connect Southland communities seeking recreation along the Cal-Sag Channel. 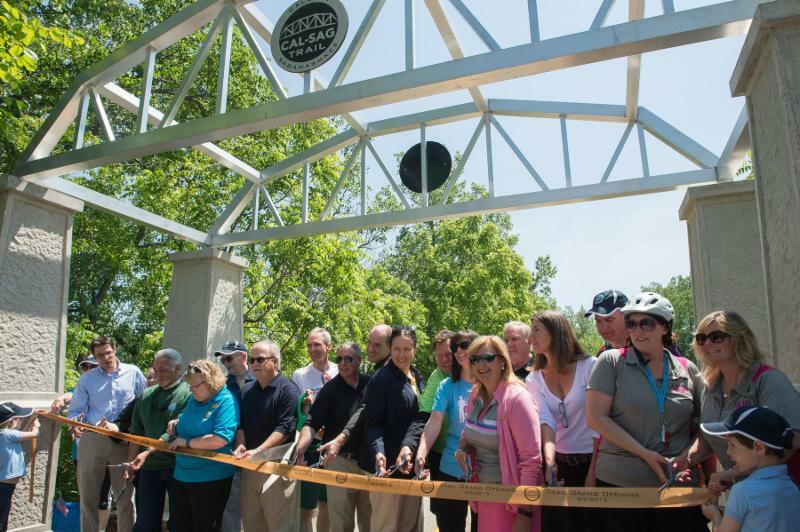 The Metropolitan Water Reclamation District of Greater Chicago (MWRD) joined federal, state and local officials to open the west segment of the Cal-Sag Trail, extending 13 miles from Lemont to Alsip. The MWRD dedicated half of the land on which the trail was built. "We are thrilled to make this contribution and see the first half of the Cal-Sag Trail come into fruition," said MWRD President Mariyana Spyropoulos. "This trail will connect communities and lives, and it is our belief that everyone should have access to our waterways and green space. The Cal-Sag Channel is particularly important to the MWRD, because we have been tasked with protecting and improving it, and we are happy any time we have a chance to highlight our work and utilize this critical resource." Although the trail has been more than 10 years in the making, area planning maps from as far back as the 1970s promoted a multi-use path along the waterway. The trail was eventually made possible thanks to federal and state contributions, MWRD land donations and extensive community outreach and fundraising efforts from local municipalities, Friends of the Cal-Sag Trail and other local organizations. When totally complete, the Cal-Sag Trail will connect 14 communities within the Southland and Millennium Reserve area, from Lemont all the way to the Burnham Greenway near the Indiana border. The eastern segment is scheduled to be complete by 2017. The 13-mile western segment runs along the Cal-Sag Channel from 131st Street and Cicero Avenue in Alsip on the east to Archer Avenue and Route 83 on the west end. Much of it runs through Cook County Forest Preserves, and it connects with several existing bike trails in the forest preserve system. While more than 185,000 people live in the 14 communities a mile from the trail, more than 1.2 million people live within a 15 minute drive of the Cal-Sag Trail. Not only will the trail preserve and enhance the natural and historical qualities of the channel and Calumet River, it will provide an accessible opportunity for recreation and healthy lifestyles, said Steve Buchtel, executive director of Trails for Illinois. "This is the most important health infrastructure project in Illinois in the last 20 years. There is no hospital, no fitness center, no physicians network in Illinois that's going to improve the health and wellbeing more for so many people as the Cal-Sag Trail. And as this trail connects to the communities east of Alsip and other trail systems, that health impact is going to grow," Buchtel said. When complete, the Cal-Sag Trail is expected to be the longest trail in the Southland and will the busiest regional trail in the Chicago area after the Chicago lakefront trail. The trail will be used by bicyclists, hikers and neighbors. In addition to recreational opportunities, the trail is expected to create a rise in business opportunities. The trail connects users to regional trails, transit, retail areas, parks, forest preserves, marinas and nature centers. "This trail has changed people's perspective about the Cal-Sag Channel 180 degrees," Buchtel said. "The towns are talking about incorporating the trail and views of the channel into development and open space projects. People are clamoring to clean up all this invasive brush that blocks view of the river-that's a word people are using. It's a river now, because of the trail." President Mariyana Spyropoulos, Commissioners Timothy Bradford and Debra Shore and others participated in the Cal-Sag Bike trail ribbon cutting recently. The Southeast Environmental Task Force joined the Sierra Club in their Beyond Coal campaign. Pope Francis: Causing Climate Change Is a "Sin"
The pope centered his environmentalist theology around the biblical creation story in the book of Genesis, where God is said to have created the world, declared it “good,” and charged humanity with its care. Francis also made reference to his namesake, Saint Francis of Assisi, who was a famous lover of animals, and appeared to tie the ongoing environmental crisis to economic concerns — namely, instances where a wealthy minority exploits the planet at the expense of the poor. “Creation is not a property, which we can rule over at will; or, even less, is the property of only a few: Creation is a gift, it is a wonderful gift that God has given us, so that we care for it and we use it for the benefit of all, always with great respect and gratitude,” Francis said. Francis also said that humanity’s destruction of the planet is a sinful act, likening it to self-idolatry. Talk about understatement! To the shock and outrage of state and national green groups, the Obama administration earlier this month gave conditional approval to a controversial proposal by Shell to drill for oil in the Arctic Ocean this summer. The exploration plan for the Chukchi Sea entails drilling up to six wells approximately 70 miles northwest of Wainwright, Alaska. Activists warn that this “unconscionable” decision to ignore the counsel of scientists begs disaster. Decades of international conferences and non-binding agreements have done nothing to stop the escalating destruction of the global environment. Melting ice caps — the most obvious measure of climate change — has served to open vast new areas for exploitation. Disaster capitalists rejoice! We can’t wait for some savior from the Democratic Party. A Washington Post survey of 2016 candidates — from both parties — found little promise to change course. It is up to us to create a political situation where “business as usual” is interrupted. We find inspiration in Kayaktivist flotillas blocking passage of Shell drilling rigs berthed in Seattle. Hundreds of protesters on land and sea challenged the leasing agreement between the city and Shell with “Paddle in Seattle” action on May 16. Environmental organizations are spreading a Pledge of Resistance to Arctic Drilling and planning events in other ports. Two activists climbed onto the chain anchoring the Arctic Challenger ship in Bellingham Bay over the weekend. Greenpeace has released a video, A Song of Oil, Ice and Fire, where apocalyptic montages of actual oil spills replace backdrops of iconic paintings like Andrew Wyeth’s Christina’s World. 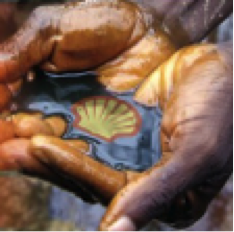 Support the coalition of activists, artists and “noisemakers” at sHellNo.org. The World Can't Wait Chapter in the San Francisco Bay Area can be reached at sfbaycantwait.net.